Charlie Rich, with rockabilly roots that go back to Sun Records days, found his way to number 21 in the fall with a song called “Mohair Sam.” It was noted by most parties involved that this was the song playing on Elvis Presley’s jukebox the day the Beatles came over to visit. Just as Elvis had inspired an influx of rockabilly-tinged artists to head for Sun Records in the mid-50’s, the Mid-South bands who were in their infancy at the time The Beatles played the Ed Sullivan show were beginning to make an impact locally in the mid-60’s. And often in their music you can hear the influence of the British sound re-translated through the Mid-south prism. From out Frayser way came a band called The Castels. As Don Miller would note, they were just a carport band, they couldn’t afford a garage. Don and his twin brother Dave found their entrée into the world of recording by doing yard work for Bill Black, Elvis Presley’s former bassist. Black discovered the Miller’s interest in music, and worked with the band at his recording studio, Lyn-Lou. By the time they recorded their single “Save A Chance,” part of their entourage included another Frayser kid handling publicity for the group, Chris Ellis. The Castels recorded a number of singles for local and national labels. In the 70’s, they re-emerged as the Miller Brothers, and worked out of their club in Frayser, Miller’s Cave. You may have seen their publicity guy, Chris Ellis, in a movie or two, perhaps as Deke Slayton in Apollo 13, the record promoter who worked out of his camper in That Thing You Do, or currently in The Dark Knight Rises. Sid Herring and his band The Gants from Greenwood, Mississippi showed promise when they made it to number 46 in the fall of ‘65 with a cover of Bo Dudley’s “Road Runner.” But they were pretty well limited to touring during the summer, as some of the band’s members were still in high school, and the others were in college. Lest we forget, college was the rock on which many a band’s ship floundered in the 60’s. Yes, college provided the opportunity for a better career on down the road, but of utmost importance at the time, it provided a temporary deferment from compulsory military service. Therein resided the inspiration for keeping one’s grades up and actually attending class and such; actions which didn’t work well with touring and late night gigging. Louis Paul, Laddie Hutcherson and Joe Davis were touring as the rhythm section of what was left of the Mar-keys. At one college gig, they were the only members to show up, and rather than cancel, handled the show by themselves. At that point, a band was born. While trying to settle on a name, they played The Roaring 60’s club, George Klein’s Talent Party, and held a name the band contest. The wining entry? The Guilloteens. The band’s manager took them out west, got them an equipment contract with Vox instruments, and got them signed to Hanna Barbera Records. 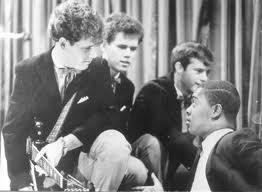 They played all the big shows; American Bandstand, Shindig, Where The Action Is. But in the end it turns out Hanna Barbera was great at making cartoons, not so hot at running a record label. When The Gentrys recorded an album to follow up on their successful single “Keep On Dancin’,” they included a song which would be a local hit for a Whitehaven band. While they didn’t chart nationally, The Breakers knocked the Beatles out of the top spot locally with their single, “Don’t Send Me No Flowers (I Ain’t Dead Yet. )” The song was written by a neighborhood friend, Donna Weiss. The draft eventually broke up the Breakers. In this case, even college deferment didn’t help. But Donna Weiss kept writing. She would collaborate on a song with Jackie DeShannon in 1974, “Bette Davis Eyes,“ which would find the top of the charts with a new arrangement, performed by Kim Carnes in 1981.